Hey hey hey, poets and readers. Happy 2·12, 3·8, 4·6, 2·3·4, 2·2·2·3, and (in deference to our favorite, the word problem) two cubed times three and of course one times twenty-four. Math, math, math. Now I can say 4/5 of National Poetry Month 2012 is gone. Hail and farewell. Ave atque vale. Gallia est omnis divisa in partes tres. Semper ubi sub ubi. Back to the work of the day: prompts, prompts, prompts. Maureen Thorson says, "Today’s challenge is a lipogram/Beautiful Outlaw/Beautiful In-Law." Robert Lee Brewer tells us his "final Two-for-Tuesday prompt" is a love poem or an anti-love poem. Andrea Boltwood suggests "an exaggerated or fictional autobiography." Okay, here is a little ditty from me that responds to only one prompt (finally) with a pair of linked hay(na)ku that invoke Robert's love and anti-love. Earlier in the day, I was saying to myself that that's not really going to be my Day 24 poem. But, as the day went on — it's now 8 p.m. — I've thought more and more that the little ditty is my Day 24 poem. I originally wrote this poem in, really, just a couple of minutes and thought of it as a lark. A joke. But as my various daily activities unfolded and the poem resonated and echoed in the back of my mind, I slowly began to realize that it actually is much more than a joke. The flexibility of the hay(na)ku to express strong emotions and ideas in such a small space, in so few words, is incredible. Although we all know the formula that's spoken by the speaker pulling off flower petals is an alternation of "yes" and "no," the one word / two word / three word structure allows the phrase she loves me to repeat twice in the first stanza, as if to expand and magnify its power and significance. The word NOT, since it is forced into the second stanza by the hay(na)ku format, is separated from the positivity of that double she loves me. But then that same word demolishes the house of cards that is the opening stanza, in a much more devastating fashion than the simplistic alternation of the childish back-and-forth formula she loves me / she loves me not would seem to allow. The second stanza then becomes a repository for negativity with almost all six words forming the speaker's knell of increasing sorrow and loss. If the poem were not in the hay(na)ku structure, I think this probably would be just a small farce. But the rigidity of the form's architecture underlines how the speaker is limited and constrained by the situation, by the unmitigated and unrelenting circumstances of this love or anti-love. Moving on . . . no poem from Catherine tonight. I'll post it later on when she finishes it. Our featured NaPoWriMoblog today is Jennifer Bullis: Poetry at the Intersection of Mythology and Hiking. Isn't that the most glorious subtitle ever? I'm imagining Loki and Thor in matching Gravity Defyer sneaks speedwalking up a mountain trail. They'd be movin! I know, right? 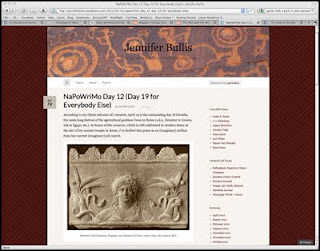 I really appreciate Jennifer's attitude to the whole NaPoWriMo/poem-a-day busyness; her current post's title is "NaPoWriMo Day 16 (Day 23 for Everybody Else)." She's not scrambling like many — I'm guilty too — to write 7 more poems to get that 16 up to 23. No fuss. And that poem for Jennifer's individual Day 16 has the funniest lines I've seen all NPM: "I can hardly hear the chickadees / screaming Cheeseburger! Cheeseburger!" When I read that, man, I fell out! I could hear Belushi (John, that is) and Ackroyd yelling, back in SNL's salad days, "CHEEbooguh CHEEbooguh, CHEEP CHEEP!" Ha! Sorry, kids, ya had ta be there. Anyway, back to Jennifer's lovely poem . . . that loud chickadee moment is followed by this whispered sentiment, "I seek and find silence / in the alder leaves' / slowly / opening / eyes," accompanied by a photo of alder leaves that indeed look like little half-opened eyes. Such a sweet moment. Take note also of Jennifer's poem for her day 11 (18 for others), titled "Lullaby for the Obsessive-Compulsive." Make sure you're not drinking something while you read it . . . if you don't want to make a mess, that is. Okay, done for the day. Exhausted from hiking with Loki and Thor, those @%¿#& show-offs! While we rest and recover, the world of poetry will be winching towards 5x5, with 5 left. Comment below, 'k? Ingat. Added 4/25/12: Here's Catherine's poem for yesterday. Brava, Catherine! Vince, I am humbled and honored. You have reviewed the hell out of my blog, and left me exalted! Many, many thanks for your generous feature. and well deserved! and well deserved! Jennifer, you're welcome. And thanks in return. Hope it brings you some readers! Judy, thanks. Indeed. Hope you're well. You make fine points about the form. The second of Jennifer's links doesn't work. Another great day at your blog, thank you. chromapoesy said it! Very much enjoyed today's read! Back again,with more to be grateful for: Catherine's marvelous "Concubine" poem. I'm obsessed with the Abraham-Ishmael-Hagar nexus, and all the other enigmatic stories involving Abraham's family. I love the domestic details of "Concubine." It's prompting me to finish up a poem from Sarah's POV that I've been struggling with for more than a week now. Thanks for the wonderful reading and inspiration. Jennifer, I attempted just now to respond directly to your blog, but had some technically difficulties. So, thank you, thank you, thank you, for the mention and for linking back to my poem. "Concubine" is one in a series of persona poems, all biblical women. I was so glad to hear from Abraham and Sarah in your lovely poems. Your line comparing the coming child's laughter to a gossamer cloak, just beautiful. Glad you were inspired. Thanks again. Anna, thanks so much. And thanks for pointing out the bad link. I've fixed it. Many thanks, Andrea. So glad you're coming each day! Jennifer, you're welcome. You and Catherine really need to talk. Seems like you have projects in common. Incidentally, Catherine responded to you below (on this same thread) ... don't know if you'll get a notification of her response here because it's not a direct reply to your comment. Did you know that you can shorten your long links with Shortest and receive $$$$$ from every visit to your shortened urls. National Poetry Month ... Poem-a-Day, People!